Namaste. How are you all? You know me, don’t you? After all, you threw such a fit every time I appeared on your TV, calling me stereotypical and racist. I am Apu Nahasapeemapetilon from The Simpsons. You are aware of racial stereotypes that I perpetuate. I know you have made me the poster boy for racial stereotypes, but before you point a finger, I want to ask: How are you any better? You get angry at white men who created me, but don’t bash an eyelash when another channel makes fun of your own neighbours living in different parts of your own country. You chortle with laughter when you hear Mithun da’ “I yam Krishnan Iyer M. I yam nariyal pani wala” in Agneepath, or when Satish Kaushik dons on the character of Muthuswamy in Padosan, exclaiming ‘Aiyoo’ after every two seconds. Were you completely okay with Deepika Padukone’s ‘Tamil’ accent in Chennai Express, which sounded even more stereotypical than I do? After all, the struggles of Chinnaswami Muthuswami Venugopal Iyer and his name were definitely only funny and not exaggerated in any way. Or did you just overlook all of that because, here, you were the ones committing the crime? incorrect English. All those people can’t be wrong! But, I guess their share of the cake is still better than the slice cut out for the Haryanvi characters. You don’t grant them proper dialogues but rather one, single word: ‘chhora/chhori’. Sprinkle a generous pinch of rudeness in the mix and you have your ultimate Jaat. And his cousin, Mr Gujarati, is just a man wearing dhotis, eating dhoklas and asking everyone “Kem cho? Maja ma?” And the cherry on the cake or rather the rosogolla are the Bengali characters whose vowels are as round as the rosogolla which is stuffed in their face all the screen time they are given on the big screen. Sure, I am an NRI and have been out of touch with Bollywood for a little while, but I would sincerely like to ask you all to fix the accents that you have blown out of proportions before you come after mine and point a finger at me. Grandfather: Happy Birthday, my dear! You are finally eighteen. Grandson: Thank you, grandpa. I have been waiting for the day I could cast a vote, and now I can do that! GF: Really? Out of all the things, you’re excited for voting? GS: Why shouldn’t I be? As a democratic country, India is built on the foundation of elections. I’m happy to be one of the people who are contributing towards a better nation. GF: It is funny how you think your vote has that much of an impact. I’m sixty, and in my forty eight years of voting, I’ve never felt like I’m making a difference. GS: Oh, come on grandpa! You know that isn’t true. What if everyone started thinking the way you do? GF: What’s to stop them? GS: Through voting, we have the power to influence. A single vote of mine can affect the fate of a large number of people. Do you not remember when CP Joshi lost his Rajasthan state assembly seat by one vote? Or when Marcus Morton became the governor of Massachusetts by bagging that one extra vote that made him the winner? GF: Those are just one-in-a-million cases. Not every election is like that. It doesn’t matter if I vote or not; what is supposed to happen will happen. GS: You can’t say that. If we were to just let it be, women still wouldn’t have the right to vote. Suffragettes like Emmeline Pankhurst, Ida B Wells, Alice Paul and Alice Stone Blackwell fought to get women voting rights. It didn’t just happen. GF: So what? Nobody’s vote matters. GS: That’s where you are wrong. Voting matters! If it weren’t for votes, countries like Ireland, Australia, Argentina, Austria, Canada and so many more would still not have granted LGBTQ rights to their citizens. GF: Much great work voting did, son! Look at America and its president. Look at Russia. They probably would have been fine if people didn’t vote to elect Trump or support Putin. GS: Maybe they would have been, but at least they had a hand in electing their government, rather than living in a dictatorship. If it weren’t for votes, Colorado would never have increased their minimum wages and Canada would never have elected Justin Trudeau, the man who is leading their country to be the epitome of equality and love. Don’t you think we, too, deserve to elect officials who take our country on a greater path? GF: We do, but I doubt it will happen with just one vote. GS: Maybe not, but at least one vote is a start. Casting even one vote is a step towards a greater country. After all, if India can vote to keep Taj Mahal in Seven Wonders of the World, we surely can vote to create a nation of tomorrow. Recently when I attended the junior annual day of AIS Vas 1 (read pg 11) and was felicitating Sanchita Tiwari, for her national achievement in archery at Khelo India, I was touched by what her mother shared. Thanking the school for all the support, she fondly reminisced the day when I met her first and promised to hone her daughter’s talent as an international level sportswoman. While she thanked me for keeping my promise, I knew this wouldn’t have been possible without the support of parents. Today, I want to share this thought with all Amity parents, because, at Amity, we constantly strive to provide best platforms and state-of-the-art facilities to the young minds we so lovingly nurture. But these platforms alone cannot nurture if we do not have support of the parents to come forward and make best use of all these opportunities. One such platform is The Global Times, which you are reading right now, conceptualised to give every child an opportunity to think, write and create. I am very happy to read this special edition taken out by the students of AIS Vas 1. 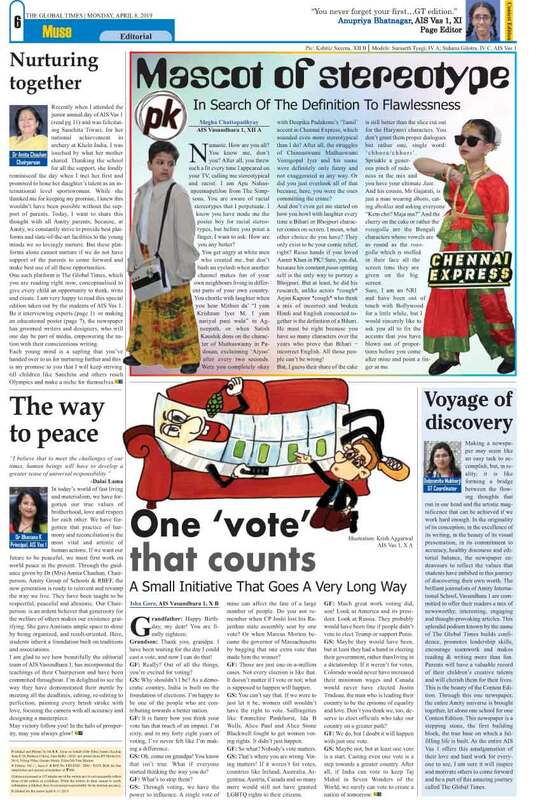 Be it interviewing experts (page 1) or making an educational poster (page 7), the newspaper has groomed writers and designers, who will one day be part of media, empowering the nation with their conscientious writing. Each young mind is a sapling that you’ve handed over to us for nurturing further and this is my promise to you that I will keep striving till children like Sanchita and others reach Olympics and make a niche for themselves. In today’s world of fast living and materialism, we have forgotten our true values of brotherhood, love and respect for each other. We have forgotten that practice of harmony and reconciliation is the most vital and artistic of human actions. If we want our future to be peaceful, we must first work on world peace in the present. Through the guidance given by Dr (Mrs) Amita Chauhan, Chairperson, Amity Group of Schools & RBEF, the new generation is ready to reinvent and revamp the way we live. They have been taught to be respectful, peaceful and altruistic. Our Chairperson is an ardent believer that generosity for the welfare of others makes our existence gratifying. She gave Amitians ample space to shine by being organized, and result-oriented. Here, students inherit a foundation built on traditions and associations. I am glad to see how beautifully the editorial team of AIS Vasundhara 1, has incorporated the teachings of their Chairperson and have been committed throughout. I’m delighted to see the way they have demonstrated their mettle by meeting all the deadlines, editing, re-editing to perfection, painting every brush stroke with love, focusing the camera with all accuracy and designing a masterpiece. May victory follow you! In the halo of prosperity, may you always glow! Making a newspaper may seem like an easy task to accomplish, but, in reality, it is like forming a bridge between the flowing thoughts that run in our head and the artistic magnificence that can be achieved if we work hard enough. In the originality of its conception, in the excellence of its writing, in the beauty of its visual presentation, in its commitment to accuracy, healthy discourse and editorial balance, the newspaper endeavours to reflect the values that students have imbibed in this journey of discovering their own worth. The brilliant journalists of Amity International School, Vasundhara 1 are committed to offer their readers a mix of newsworthy, interesting, engaging and thought-provoking articles. This splendid podium known by the name of The Global Times builds confidence, promotes leadership skills, encourage teamwork and makes reading & writing more than fun. Parents will have a valuable record of their children’s creative talents and will cherish them for their lives. This is the beauty of the Contest Edition. Through this one newspaper, the entire Amity universe is brought together, let alone one school for one Contest Edition. This newspaper is a stepping stone, the first building block, the true base on which a fulfilling life is built. As the entire AIS Vas 1 offers this amalgamation of their love and hard work for everyone to see, I am sure it will inspire and motivate others to come forward and be a part of this amazing journey called The Global Times.